I took a great advantage of a work trip to San Francisco. On a Good Friday morning, I woke up in my hotel at the Hilton in the Financial District. Quite early! I was able to get my running shows on with my iPod and also a water bottle and got out the door at 5:45 AM. I headed East to Embarcadero toward Pier 1 toward the bay. I then headed North along the bay passing all the piers. At one point, I spotted a large crowded line for what looked like a ferry to Alcatraz. I had heard tickets are tough to get for that event. As I kept running along passing all the piers, I eventually reached Fisherman's Wharf about 4 miles into my run. At this point, it's still fairly dark but admired all the restaurant's and attractions in the area. After passing through Fisherman's Wharf, I could see Ghiradelli Square on my left. 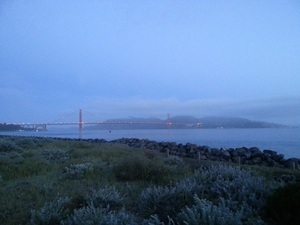 As I am now closing in on 6 miles, I've reached closer to view of the Golden Gate Bridge! At this point the sun is rising over Alcatraz and the view has been remarkable. 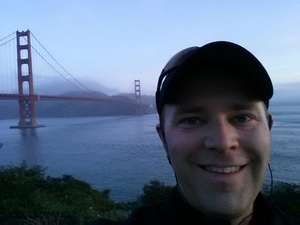 As I reached the south side of the Golden Gate Bridge, I then began my 1.7 mile run across the Bridge. The bridge run was flat for awhile but eventually became long steep upward climb in the middle of the bridge. It was noisy but not as bad as I thought it could be with rush hour traffic starting to pick up and not far from the cars but completely enclosed and safe along the path. About twice I stopped to admire the views and take some pictures and just enjoy my time on the bridge. I successfully made it across! Now another 1.7 mile run back across the bridge! At this point I've ran about 7.7 miles. Once I finished my run across bridge (coming back) I've now reached 9.4 miles (or so). As now I'm descending downward toward the San Francisco Trail and trying to mentally make my way running all the way back to my hotel. Around 10 miles and now past 8 AM. I spotted a sign for an Uber pickup/drop off parking lot. I thought, I'm quite exhausted and really don't think I have the stamina (and time) - I do have a presentation to still prepare final details at 11:30 AM! Well, I signed up for my first Uber ride! It was a better experience than getting a cab I thought, and I only had to pay $4.80 to take me 4 miles!